Labor unions weren’t happy when Governor Jerry Brown signed the Public Employees Pension Reform Act of 2012. The law, which applies to government workers across the state, allows government agencies more flexibility in extending the retirement age, increase employee contribution, and halt the practice of “pension spiking” for new employees. A full summary of the legislation is at the bottom of Brown’s press release from last September. In the battle over pension reform, the federal government has given transit unions a powerful hostage: federal appropriations to transit agencies. U.S. Secretary of Labor Thomas Perez decided that the new pension law runs afoul of the 1964 Urban Mass Transportation Act. Perez, and two of California’s more powerful unions, argue the state’s pension laws diminish the collective bargaining rights of unions. Perez is threatening to withhold federal funds for state transit agencies that follow the state guidelines if and when transit unions object. The Wall Street Journal argues that Perez is mis-interpreting the act and that Brown and state agencies are operating within the law. California Labor Secretary Marty Morgenstern agrees. So either the state changes labor law for transit employees, the federal government backs down and sends the $2 billion in grants that were promised, or transit agencies throughout the state lose out on roughly $2 billion in expected, and budgeted, federal funds. Potentially withheld funds include both capital and operating funds. Los Angeles Metro is first in-line to lose out on funding. The federal government will decide on a $268 million request on Friday. Next in line is the Orange County Transit Agency. Smaller agencies will be hit hard as well. Sacramento’s regional agency could lost $70 million, including funds needed for a new light rail line. Santa Barbara’s Metropolitan Transit District would have to reduce services by 30% and lay off 50 bus drivers without its federal grant. Thus far, transit unions in the Bay Area have not formally protested to the Department of Labor over the pension plans despite their ongoing strike. While Streetsblog is certainly not privy to the internal negotiations, it’s hard to imagine that the unions aren’t threatening to do so at the bargaining table. To make the issue more pressing, Moody’s Investor Services is considering downgrading the credit ratings of Metro and other state transit agencies because of the confusion over whether or not they will receive federal funding. A change in credit rating could cost agencies even more, as Moody’s ratings help determine the interest rate agencies will receive on loans that finance most major expansion projects. Brown is desperate to avoid a lawsuit over Perez’s interpretation unless funding for state agencies is secured. The Governor’s office is floating a plan to quickly pass legislation temporarily restoring the former pension plans for future employees while California and the Federal Department of Labor duke it out. Whether or not that plan will pass muster with Perez, even if it is executed, remains to be seen. The Teamsters and ATU argue for a different resolution. The unions support legislation by Assemblyman Luis Alejo, D-Watsonville, that basically excludes local and regional mass transit workers from last year’s pension law. That would impact 20,000 workers, and could open the door for every union in the state to carve out its own exemption. After all, why should one set of state workers get benefits not offered to others? While the Sacramento Bee has loudly denounced the Alejo plan, it seems their is little reason to get excited. The bill has been bottled up in committee since its introduction this Spring. It seems unlikely to gain momentum now. Even if it did suddenly move and pass both houses, it’s hard to see the proud Governor Brown signing it into law to avoid a showdown. Just like Buy America provisions… federal transit policy seems to be concerned with just about everything except, you know, transit. Transit in the USA is a pure welfare operation for the agency staffs, the transit-industrial consultant mafiosi, the trade-protected hopelessly cost-ineffective sheltered-workshop vendors, and the operating unions. If any services should happen to be delivered to the air-breathing and/or tax-paying public, that’s purely an accidental side effect of jobs for boys and grease for the palms. It’s hopeless, especially when “environmentalists” and bien-pensant voting burghers can be so transparently hoodwinked into greenwashing the most egregious waste because, after all, the Iraq War was really bad and transit is good, so really bad transit is OK.
Expect the worst — rather, actively support the worst — and that’s what you get every time. If the state government can arbitrarily change pension compensation for state workers that has been secured through a process of legal collective bargaining, then public workers effectively lose a collective bargaining right secured not only by state law but by federal law for the last half century. This seems to be the US Labor Department’s motive for urging withholding of funds. No question the consequences of this would be dire for bus riders like myself, but there’s also no question transit workers believe they are facing the kind of union-busting tactics that have been used to effectively eviscerate well-paying unionized jobs in the private sector over the past 30 years, and they’re probably right. The vast majority of transit workers are hardly getting rich or set up to live on easy street for their retirement. Many transit jobs, such as driving a bus, are demanding and stressful. These workers deserve decent pay and benefits. We apparently have enough money to bail out Wall Street banks, but expect working people in one of the most vital public jobs in a modern society to take the short end of the stick. For shame. 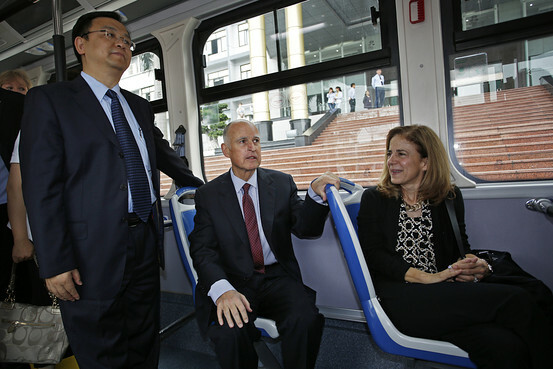 Say is that #JerryBrowned riding on one of the PRC-built BYD buses which were apparently rejected from manditory-if-you-want-to-run-in-the-USA testing at Altoona, PA…allegedly? To be fair, it appears that there may be legitimate questions about the quality of BYD’s products, but that has nothing to do with parts being produced in China. Pretty much every electronic device we own has at least some components produced in China, and they all work pretty well. PRC is shorthand for People’s Republic of China. I use it to differentiate from Taiwan, which does still also hold claim to the name “China”. The first five “pilot” buses will be built in China.from what I have read. The bus sent to Altoona was built in China. Would I be Sweden-hating if I pointed out the same issues about Volvo buses? The Altoona tests are very difficult, and even some well made buses from many other parts of the world could not pass them, or did so only with major increase in production costs. Roads in the USA are very different (poorer quality) from those found in Europe and the industrialized parts of Asia. I am trying to temper all the enthusiasm there seems to be at the moment in Los Angeles County for the BYD buses because if they do not pass the Altoona tests, they will not be able to be put in service here or anywhere else in the USA. In fact, if BYD fails Altoona, I wonder if the demo bus that tours the USA will be allowed to remain. And I don’t think a number of the local decision makers who have climbed on the BYD bandwagon appreciate this. Finally, I’ll remind you that there are a number of established bus suppliers still remaining in the USA, at least two of whom are located in California (albeit not *in* Los Angeles County). Gillig and Eldorado National make dependable transit bus products (EN also assembles the Alexander Dennis Double Decker buses destined to the USA), sales that result in capital as well as R&D remaining *in* California. I am certain they could be open to creating an electric powered bus; Gillig already did for Seattle though I admit these were Electric Trolley Buses. Oh, but that wouldn’t mean any low-wage temporary widget-tightening jobs in Lancaster now would it? I think if you said “Sweden-built Volvo buses” it might sound weird, though most people would know Volvo is a Swedish corporation and many would not know BYD is a Chinese corporation. I guess I don’t see why it should matter all that much if they’re built in the US, or China, or Sweden. EN and Gillig could have bid on these contracts, right? Maybe they see the US market for electric buses as too small/variable to justify the investment, similar to the US rail vehicle market? I’m generally in agreement on Buy America. It is a blunt policy that attempts to reverse the results of a whole bunch of broad economic policies, and puts the burden on chronically underfunded transit agencies. There is plenty of debate to be had about those broad policies, but regardless of anyone’s feelings on the decline of US heavy industry, Buy America is a pretty strange and ineffective way of tackling that. Florida needs a New Engine. My wife has been after me for a new car. new 3000 sq ft extension on my house raised my property taxes $ 15,000.
care of Everything !!! HAPPY DAYS ARE HERE AGAIN !! !